In geographical terms, Tullibardine is one of the nearest distilleries to where I call home. A short drive north and then just perched beside the A9, it’s accessible and caters for visitors. Yet in whisky terms, until recently, it’s been relatively ignored – as what came out of the distillery was average at best. For a while, a variety of cask finishes and youthful whisky didn’t cultivate much friendship from the whisky masses. The most memorable Tullibardines I can recall were frankly for the wrong reasons. Still, this all seems a footnote now as under new ownership and considerable investment, this distillery that was established in 1949 – ignore the 1488 used by marketing – has a renewed vigour and enthusiasm. The 1488 refers to the fact that there was a brewery on the site long before the existence of a distillery, so the use of the date is misleading. 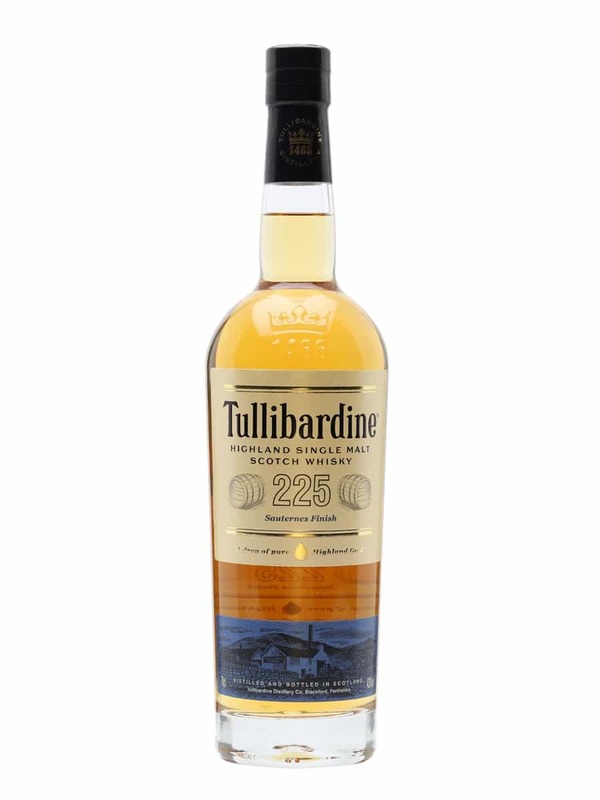 If anything, the Tullibardine that we should focus on returned to life in 2003. Considering the history of Tullibardine and the standard of its whiskies in recent times that have left a bad taste, this can be arguably traced back to the involvement of Whyte & Mackay, or Invergordon distillers who Whyte & Mackay purchased in 1993 after a heated takeover, which took longer than it needed to. Consistently, this company whether it’s via Jura or Dalmore offers a haphazard whisky, where at times the use of casks is overly aggressive as is the reliance on artificial colouring, and those casks are often of poor quality. Invergordon Distillers started the practice in earnest and valued quantity rather than quality. Whyte & Mackay had little appetite for Tullibardine and mothballed the distillery in 1994 where it remained in a state of suspended animation – until 2003 when a consortium had the vision to turn things around for the price of £1.1 million. The site alongside the A9 motorway was mainly a retail outlet with facilities for travellers who wanted to park up for a bite to eat and a little bit of Scottish shopping. The existence of a small distillery at the foot of the site was more an oddity than an attraction. The consortium soon discovered that the majority of Tullibardine’s maturing stock was held within casks of poor quality. This explains some of the finishes we’ve seen over the years and elsewhere such as with Bruichladdich where revenue needed to be established and what maturing whisky they did possess needed finishing. In 2011, the current owners, in the form of French wine and spirits company Picard Vins & Spiritueux, purchased Tullibardine. This new player on the scene had already acquired the Highland Queen brand in 2009 from Glenmorangie and was in need of a distillery. For Tullibardine it seemed the logical move, offering a new level of investment that was clearly needed to take the distillery to a new level. The consortium had already removed many of the mistakes of the past in the warehouses and established a new emphasis on quality, in effect making Picard’s role less of a reboot and more of an upgrade. The motorway service options soon closed and the car park became filled with casks awaiting filling. Warehousing and facilities were expanded and, all of a sudden, Tullibardine had a new youthful range, but one that has prompted many to reconsider the distillery in its entirety. Distilleries much like football teams have form and you can plot the trajectory of these over time. For many, there are dips in form (Bowmore 1980’s) or others content to occupy the lower leagues (Jura) whilst others attempt to build something and progress. We’ve seen this with Deanston in recent times and just maybe Tullibardine is one to keep an eye on. This release is the 225 Sauternes finish and the bottle was kindly given to me by Michael at the Carnegie Whisky Cellars in Dornoch; a fine shop if you’re in the neighbourhood. The 225 comes from the size of the casks used to finish this whisky which holds unsurprisingly 225 litres. Sauternes for those unaware is a French dessert wine and these particular casks come from Chateau Suduiraut, which is located in the Sauternes and Barsac region of Bordeaux that dates back to the 15th century. A bottle of this whisky will set you back around £40 and its bottled at 43% ABV. Now, Sauternes is my least favourite type of cask finish as it’s a powerful thing that must be used sparingly. Quite often it’s used to mask flaws in a whisky or a previous cask by swamping the flavour spectrum and injecting a new flourish. A perfect tool given the previous situation outlined in this article. In recent times, these types of casks have been used by several distilleries or bottlers such as the Scotch Malt Whisky Society to mask imperfections. Its sweet nature with the strong essence of oranges, lemon peel, tangerines and other citrus qualities can change the style of a whisky in a relatively short period. Therefore, I’m always concerned and dubious when faced with a Sauternes influenced whisky, although at times as shown by the Springbank Society 9 year old release it can prove memorable when the spirit is tough enough to work in tandem with its sweet aspects. On the nose: a sharp citrus bite initially then grapefruit, pineapple chunks, lemon rind and almonds. More sweet fruit development with golden raisins and a light, fresh vanilla with a touch of ginger. Towards the end there’s oranges but mainly I’m reminded of frangipane. In the mouth: not as layered or fragrant instead, the vanilla slowly builds into a sweet pastry then more of the orange. A touch of lemon, meringues, pepper and a whipped cream with a little youthful alcohol on the fringes. This is a pretty inoffensive whisky and I suspect prior to the introduction of the Sauternes cask it was lacking any memorable dimension. Post-cask, it’s less benign and dull, but it’s far from memorable. A very easy sipper if you prefer a touch of sweetness and often available in stores discounted for about £30, which seems a fairer price for the limited experience. Well, could Spring have finally arrived today in Scotland? We know how to make the most of such brief opportunities, particularly any sunshine that does..